Primers were designed to PCR out the heme oxygenase and pcyA coding regions from the UT Austin plasmids. Due to the RE sites in these nonBB plasmids, their ends are given ApaLI and KpnI sites. 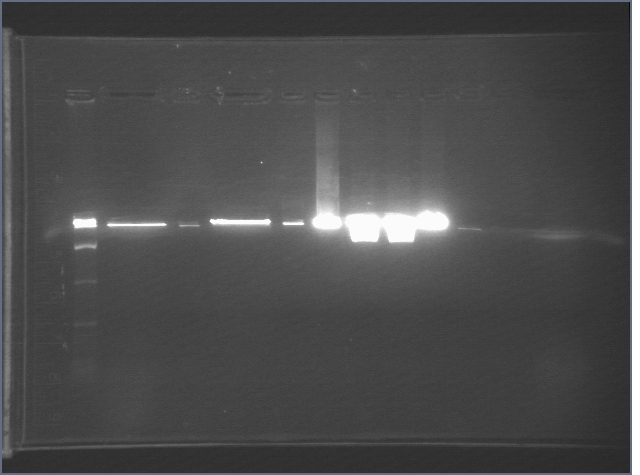 The same is done for the P3 vector (the primers are such that we can PCR out the backbone, along with the RBS and terminator. The "P3-GFP" primers should also work for P1. However, I'm a little concerned, b/c the annotation of the P1 and P3 vectors disagrees with the sequence given for the RBS and terminator subparts. The same thing was done for mtrB (as for HO+pcyA). This gives us constitutive mtrB for testing the complement. 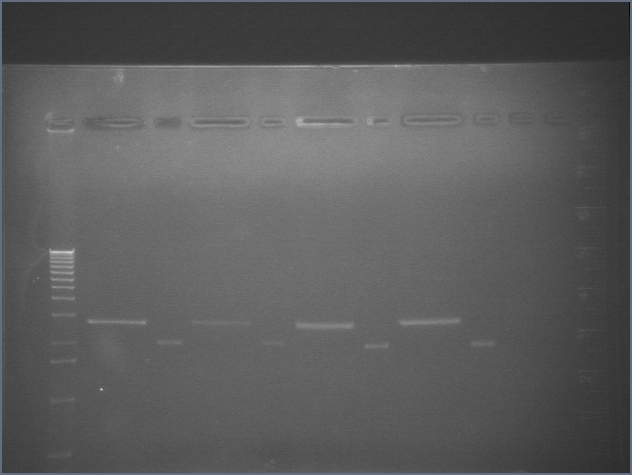 The primers arrived today, so PCR was performed using a colony of Shewanella Δ EnvZ (which should still have mtrB). 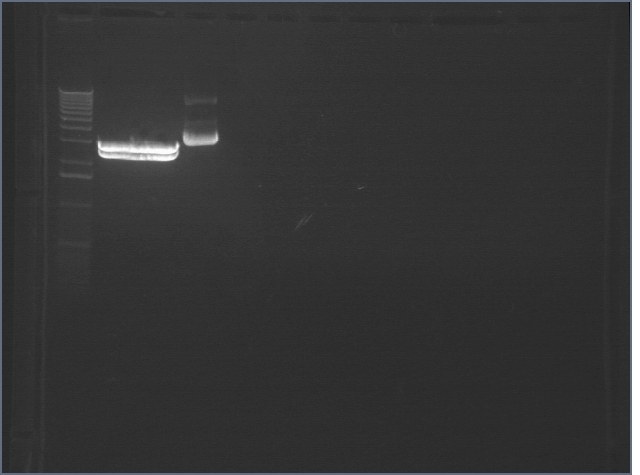 PCR failed- perhaps annealing temperature was too high or too many cells. Will retry. 5' phospho oligos were made to anneal into what is effectively P38 and P39 digested with ES. 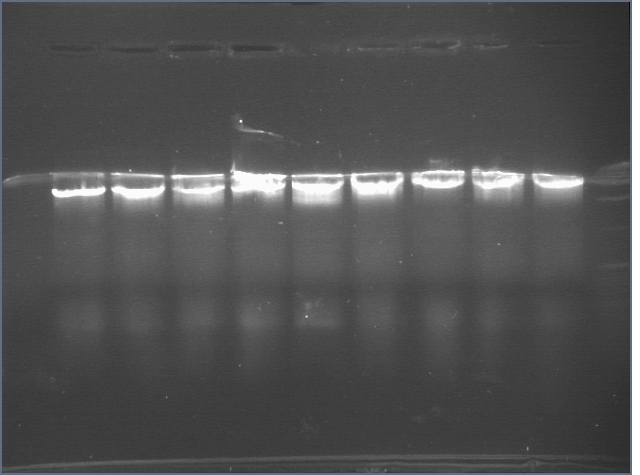 Run on gel; bands cut and frozen. 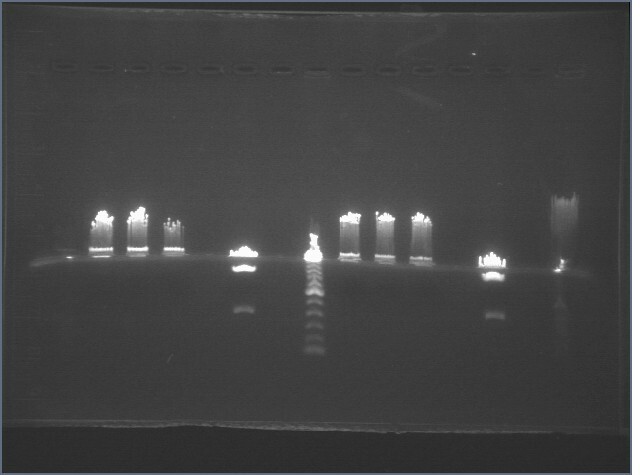 We retransformed all of these on 07/15 using 5 μL DNA for 50 μL DH5α cells. We put the cells directly into liquid cultures after transforming them. We digested P53/54 with ES and P58/59 with EX. We intend to ligate these parts together. This will give us RBS + TetR/LacI + terminator + pTet/pLac + RBS + GFP + terminator. We also digested P90 with SP and P48/P49 with XP. This will give us the CDF origin in a p15A vector with an Amp or Cm resistance cassette. We followed the standard digest protocol under the "General Protocols" section. We used the standard digestion protocol. P90 with P48/P49. This will give us the CDF origin in the P1 vector with Amp and Cm resistance cassettes. We will also add P63, a terminator, and the high and low constitutive promoters (P38 and P39) later. P91/P76 with the high and low constitutive promoters. This should give us the entire Lac and Tet plasmids. 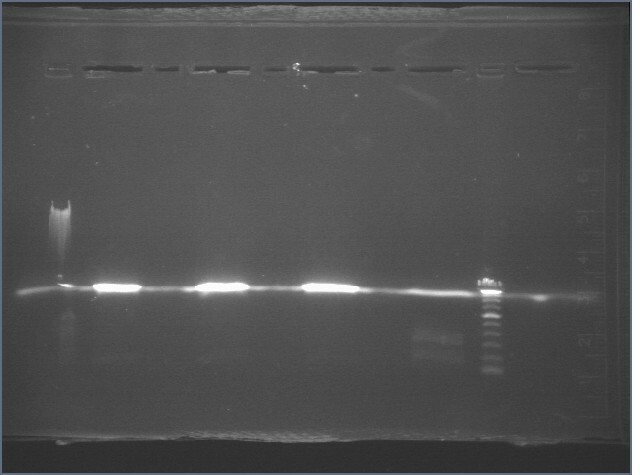 We digested more DNA (scaled everything up) to improve our yields from the gel extraction. 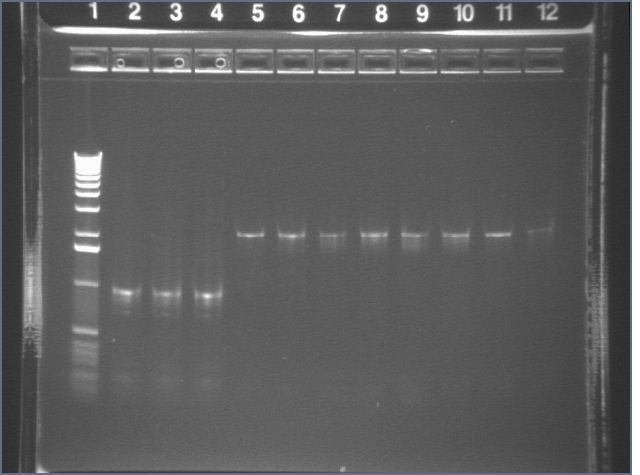 These ligations were transformed into TOP10 cells that we made chemically competent. 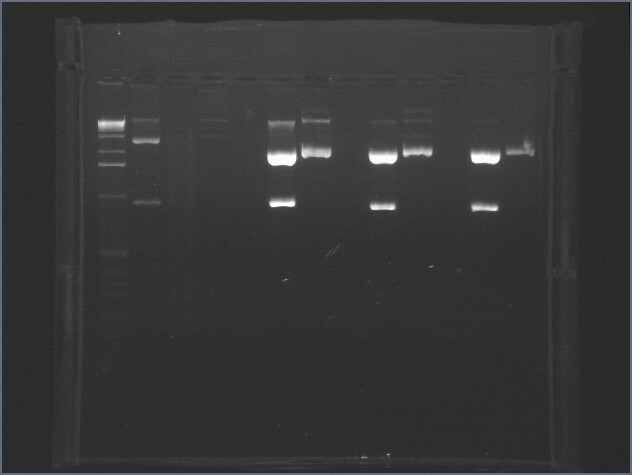 We transformed cells with repressor plasmid (P27), and duet vector (P12 and P13) with LacI with p59 (pLac + GFP) and vice versa in order to test the inducible system in S1. Plate Marker Description Picked Colonies? Sample Media (5mL of each) Grew? Sample Plate (original w/ second antibiotic added on) Grew? Grow up 10mL culture overnight with antibiotic at 200 RPM, 37 degrees. Dilute 2.5mL of overnight culture into 50mL of fresh LB. Grow at 200 RPM, 30 degrees until OD660 = 0.2. Split culture into two 25mL cultures, and put one in 30 degrees and the other in 40 degrees. Grow for 4 hours at these separate temperatures at 200 RPM. OD and measure YFP fluorescence (Ex: 514, Em: 527). P1 and P74 cut and uncut bands are in the right place, but P84 and P85 both have 2079 bp backbones, which does not account for the ~900 bp bands. We searched the sequence of the backbone in the registry for internal cut sites that could have produced the band, but found none. 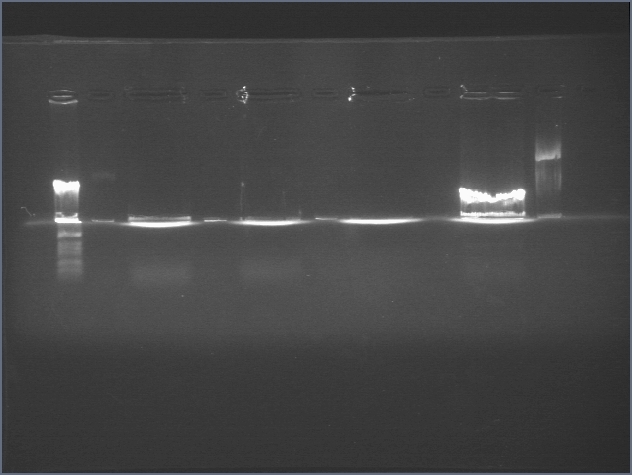 Only P1 and P74 were extracted and gel purified. 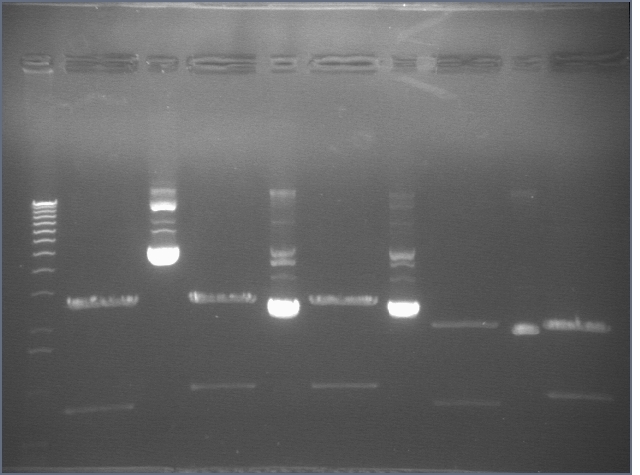 P84 and P85 bands were extracted and gel purified so they could be digested with XP. 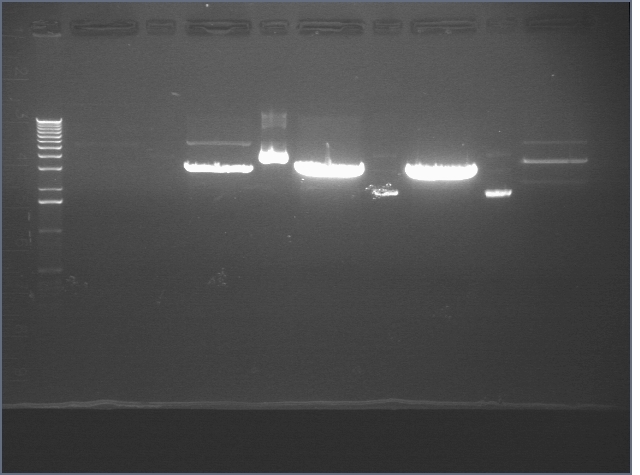 After digestion, samples were PCR purified (7/16). P84 and P85 were found to have an internal XmnI cut site, so single cut digests were performed for both samples with XbaI, PstI, and XmnI. Triple digests were also done with all three enzymes. Digestions were incubated overnight at 37°C. The 2314 bp bands for the triple cuts of P84-5 were extracted and gel purified. The P84-5 inserts are roughly the same size as the vector (P1) so we tried different ratios of insert to vector. Ligations were then transformed in DH5α cells. 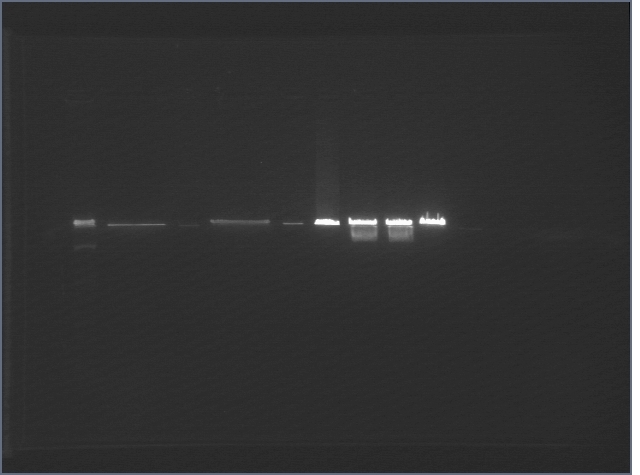 5 uL Ligation in 50 uL chemically competent E1 cells (old batch). Plates were incubated overnight at 37°C. P75 (P1 + P74) Kan >100 Small, white, fluorescent under microscope. For positive control plates, see the Competent Cell Test Plates under Housekeeping. All cultures grew, except for (-) ctrl. P1 was dephosphorylated the day before, and used for this ligation reaction as well. 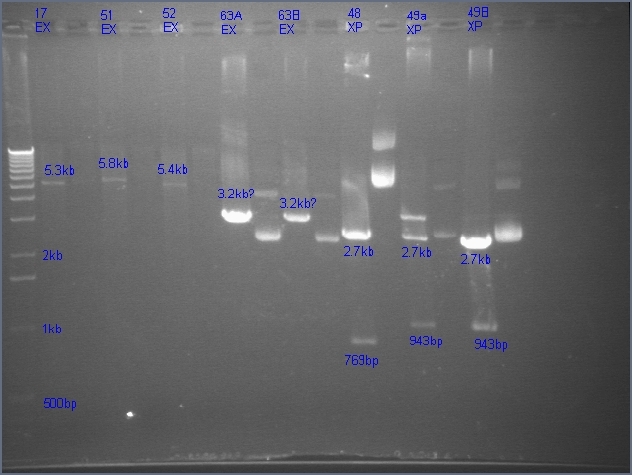 P92 PCR Kan 50+ small, white colonies. Used S1 cells frozen for electroporation. 1mm white/ cream colonies present on all plates after the 2 day incubation resemble the contamination we have observed in other E. coli plates. This is of interest because Kan is not as vulnerable to degradation as Carb/ Amp are. P75a and P75b were both very bright in S1. Thermoinducible cI857 was ordered from [ATCC]. 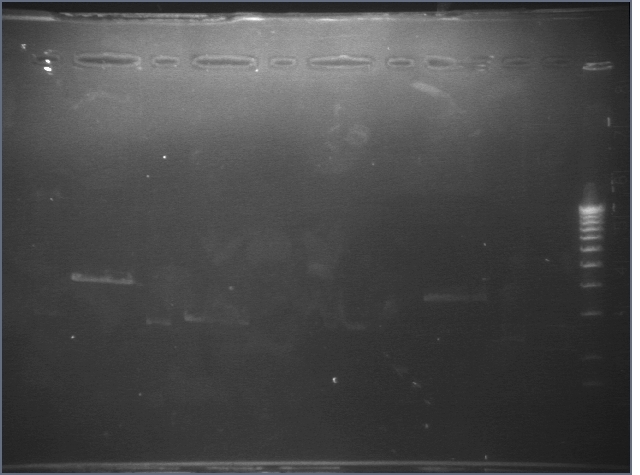 The plates of P84-5 originally transformed in E. coli from the registry were used as a standard for fluorescence for the thermoinducible Lac colonies. They were left overnight at 37°C to stimulate thermosensitivity, which should lead to YFP expression. Although they were not very bright, they glowed. Compared to these plates, the P93 1:3 transformed in S1 was noticeably dimmer, though it had been incubated at 30°C O/N. Plate will be restreaked and grown at different temperatures after the weekend. p59b (glycerol) + cntl 1.458 131.240 90.014 #DIV/0! #DIV/0! #DIV/0! mtr A negative control 0.097 129.620 1336.289 #DIV/0! #DIV/0! #DIV/0! mtrB negative control 0.000 109.910 #DIV/0! #DIV/0! #DIV/0! #DIV/0! LB 106.800 #DIV/0! 0.000 101.160 #DIV/0! #DIV/0! #DIV/0! LB 0.000 120.050 #DIV/0! 0.000 110.640 #DIV/0! #DIV/0! #DIV/0! We are not completely sure if the LB Kan we used contains Kan or if it is just plain LB. So we also made a culture of P95, which is Amp resistant, in the this medium. So if it doesn't grow, then Kan was added to that bottle of LB. 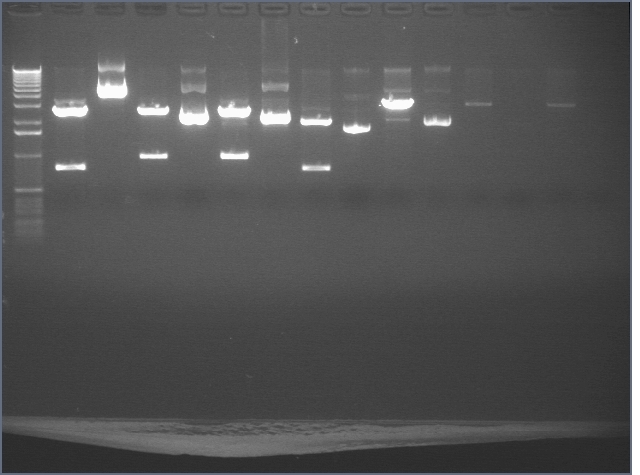 07/19: All of these cultures grew except for P46A. The LB Kan really does have Kan. Ensure we have petri dishes, LB, LB agar, and agarose. Make LB-antibiotic medias as necessary. As per Jason's lab's protocol. 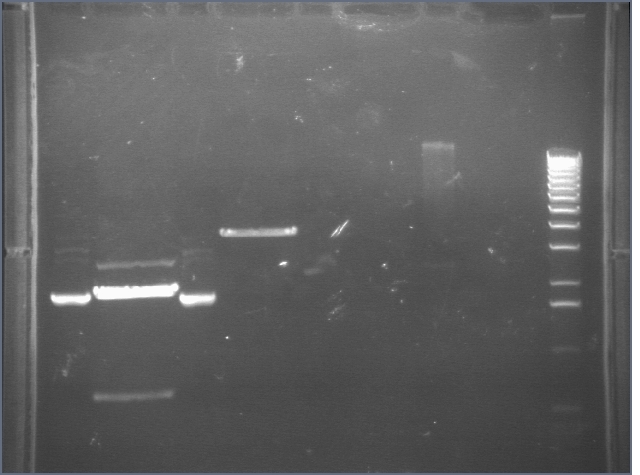 We transformed each of the UTAustin plasmids (individually) and a new strong RBS into TOP 10 cells. The RBS has been miniprepped. The UTA plasmid transformants formed a lawn, so were restreaked first. Liquid cultures have been grown up. P87 requires mutagenesis to remove a PstI site ~100 bp into the coding region of the Cph/EnvZ fusion. We miniprepped P86A, P86B, P87A, P87B (all in E2) from liquid cultures. The amp and cm negative controls did not have any growth. This page was last edited on 21 July 2008, at 09:57.